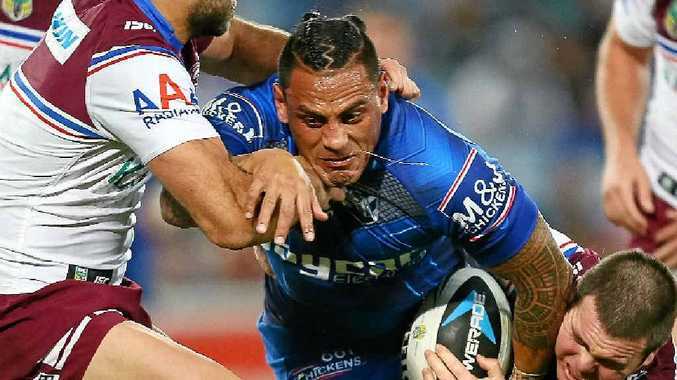 IT WAS the Krisnan Inu show at ANZ Stadium last night, with some freakish plays securing a thrilling 23-16 win for the Bulldogs over the Sea Eagles. After booting a freakish 65m drop-out, which veteran caller Ray Warren described as the biggest one he had ever seen, the Kiwi and Samoan international then scored an outstanding try. It put the hosts up 12-6 in the 36th minute, after Manly's Dunamis Lui and Canterbury's James Graham traded four-pointers, from close range. Inu beat three defenders after an amazing left-foot step to score from 20m out. Manly hit back when an assist from Brett Stewart put youngster Clinton Gutherson over, but Stewart's air swing at a Michael Ennis grubber saw Corey Thompson score and gave Canterbury a 16-10 lead. The Sea Eagles refused to die when Justin Horo scored off a Mitch Brown error on the hour, but the Bulldogs secured their surprise victory with a Michael Ennis field goal, and five minutes left on the clock. Ennis then scored a speculative try in the final seconds to cap a great game, after good hands from Tim Browne saw him swoop on a loose ball and deliver the final pass to his delighted captain. SEA EAGLES 16 (D Lui, C Gutherson, J Horo tries; J Lyon 2 goals). At ANZ Stadium last night.